This week the challenge at JAI was to Just Add Easter. Simply enough task, wouldn't you think. Not so much, as you will see. I knew that I wanted to make some sort of 3D item to hold easter eggs. This was probably a mistake, but since I don't really have any easter stamps, I figured I could at least put 3D item to good use. I have a few tutorials pinned, as I am BAD at 3D stuff, so I figured I'd give this one a whirl. This in itself was a bit of a mission - it took me AGES to work out why my edges weren't lining up perfectly like they were in the tutorial. Then when I filled it with eggs I found it was just a teensy bit to small and I really, really disliked the image I stamped on the clear top. So I retreated back to the craft room tonight to start over. Unfortunately I went off on a bit of a tanget and this is what I ended up with. Now, all in all, I don't mind them, but they're not very 'Easter', are they? I mean, if I took the eggs out and had stamped a different sentiment on the back of the tag, they could have been for anything. I guess it's because I changed my mind mid stream. Originally the boxes were going to be purple with gold embossing, to co-ordinate with the Cadbury eggs I had on hand (school fundraiser). But I didn't have any gold ribbon and I forgot to pick some up today at lunch. And, despite the metres and metres of ribbon I do have, nothing I had was going to do the trick. So I picked a different ribbon, which lead to picking a DSP instead of embossing, which lead to this. You may notice that my eggs are not Cadbury purple and gold - problem with making the boxes bigger is that you fit more eggs in. Turns out I didn't have enough Cadbury eggs to go round so I had to substitute - just another bump in the road. Anyhoo, I intend to give these to Harry to give to his teacher and the ladies at after school care. Hopefully they will enjoy them. Well, I'm off - I normally schedule these posts but this one is actually live and it's late. Have a good one and thanks for visiting. Oh, and be sure to check out what the rest of the DT came up with. Unlike me, they can actually Just Add Easter. Lol Jo, I completely 'got' your commentary - it's happened to me! 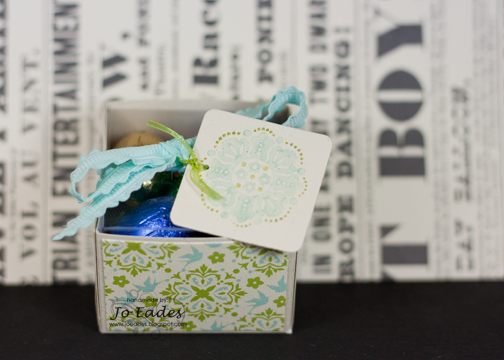 Regardless of your bumps these little boxes turned out beautifully and I think they're just perfect for Easter! I think they are great Jo, gorgeous colours and perfect for an easter gift. I'm sure they will go down a treat with the recipients and TFS the measurements. You do make me laugh with your posts! 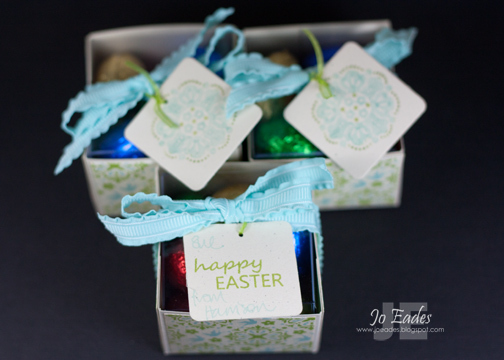 These are little cute jewels of easter boxes Jo. I reckon a kid will be more concerned about the chocolate inside but a grown up easter fan would appreciate the box lots!! This a very pretty little box Jo. I love the colours you've chosen for them. No mistakes here! Love the bird's eye view of your cute 3D Easter project.